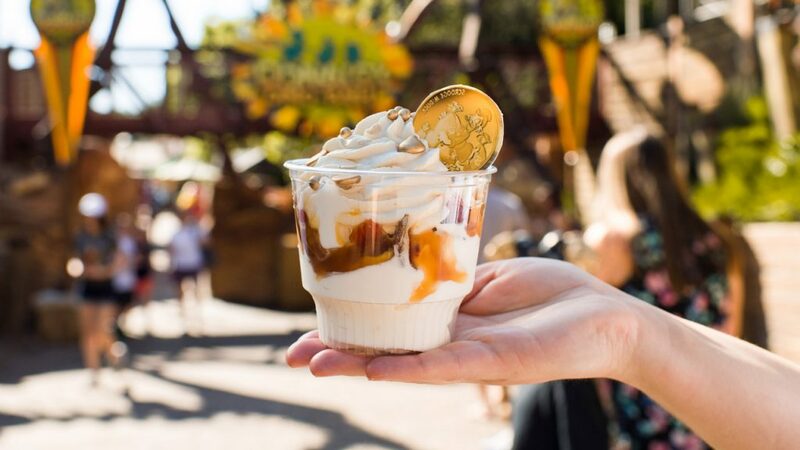 Are you ready to take a tasty adventure through Disney’s Animal Kingdom® Theme Park? If so, you need the Disney’s Animal Kingdom Tasting Sampler. With this digital value card, you will be able to enjoy a delectable day of flavorful food and beverage as you taste your way around the park’s carts, kiosks, and after 5 p.m. at quick-service restaurants with a bonus digital value card. The sampler costs $50 and includes two digital value cards: one $50 card that can be used at over 40 outdoor food and beverage locations throughout the park (and does not expire), and a bonus $10 card that can be used at the following quick-service restaurants after 5 p.m. from April 12-22, 2019: Restaurantosaurus (DinoLand U.S.A), Pizzafari and Pizzafari Family-Style Dining (Discovery Island), Flame Tree Barbecue (Discovery Island), and Satu’li Canteen (Pandora – The World of Avatar). At each of the outdoor food and beverage locations, you can use the $50 card to purchase anything on the menus. Among these dishes are some favorites from last year’s Tasting Sampler as well as a whole host of delicious new bites. Here’s a list of all the new and returning eats and treats that you won’t want to miss. Disney’s Animal Kingdom Tasting Sampler can be purchased through April 22, 2019 at noon and can be used at Disney’s Animal Kingdom Theme Park during regular operating hours. When you purchase the sampler, you’ll receive an email for each digital value card. Each email will have a barcode that can be added to their digital wallet on their mobile phone and scanned at most food and beverage locations throughout the park. For a full list of participating locations and menu offerings, visit any food and beverage location at the park. Disney’s Animal Kingdom Tasting Sampler $50 digital value card can only be redeemed at the participating locations indicated on the Tasting Sampler map, which will be available at any participating food and beverage location in the park. It cannot be used at Table-Service Restaurants or Quick-Service Restaurants and does not expire. Disney’s Animal Kingdom After 5pm Quick Service Bonus $10 digital value card may only be redeemed at the five locations above and is not valid for use after April 22, 2019. $50 Disney’s Animal Kingdom Tasting Sampler and the $10 Disney’s Animal Kingdom After 5 Quick Service Bonus are separate products and cannot be combined.